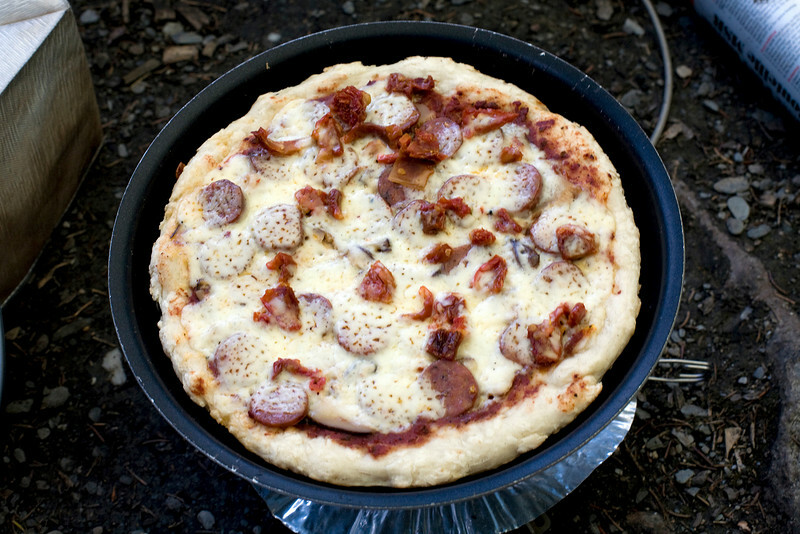 Has anyone ever tried the Fox Hill or Omnia ovens in their Escape? The Foxhill looks pretty much like the Coleman, except that you lift the top ( letting all the heat out ) vs. the Coleman with a front opening door ( that you could open a crack ). The door on the Coleman is on a hinge. Looks like with the Foxhill you have to lift the lid and figure out what to put it down on so you don't melt something. That's just my observations from looking at the web site. The other one looks like it's basically a light weight dutch oven. I'm not sure it even counts. Glenn, for what it's worth, the Fox Hill gets way better word than the Coleman, it's got a thermometer, and you can use it inside. People swear by them and say that the fact that you have to open the top isn't such a biggie (I use a countertop convection oven to do much of my baking in the house and the same thing happens with that ... I just act accordingly). I'm sure I would figure out a place to stash the hot top. Per the Omnia ... it's specifically designed to bake inside and is way lighter than a cast iron Dutch oven. I don't understand why you couldn't use the Coleman inside, since it's a square metal box and so is the Foxhill. I must be missing something. My Coleman has a thermometer. I'm not sure I'd trust it any more than I trust the one on my top end Weber BBQ at home, but it is there. I use a CDN oil-filled oven thermometer for accurate oven temps. I've got back ribs on the Q at the moment, slow cooking at 225f. What's the address for the site comparing the two? Not that I'm in the market for another oven. As for the lighter version of a Dutch oven, lighter weight means it won't hold or distribute temp as evenly as heavier cast iron. It can't be any other way. In any case, the main issue I had with the Coleman when I used it on the ThunderRange butane stove was that I couldn't get the temp down below 350f. On the Weber Q I could get it down to 225f. Our propane burns colder than the butane, so that might not be an issue for you, but as I understand it, baking is a science, requiring close attention to weights and measures and temps. The Foxhill is only 3 lb 11 oz (4 lb 2 oz for the double), whereas the Coleman is 7 lb. Otherwise they way they bake is essentially the same. I just read a few reviews, some by folks who have used both. They all say without exception that the Fox Hill is better, mostly because it holds the heat better, and keeps an even accurate heat. 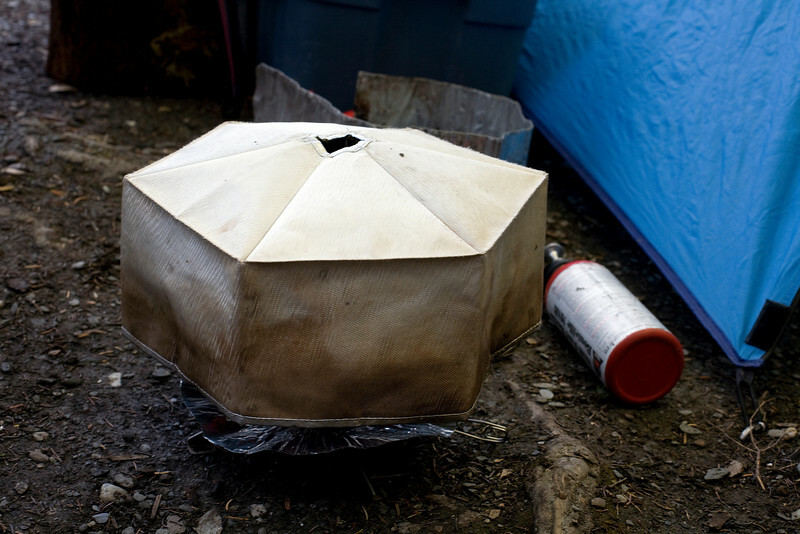 It seems many people wrap the Coleman with aluminum foil to keep the heat in. That said, that Omnia oven looks like a great idea for baking, and it gets glowing reviews from everyone who has tried it. The big advantage is that it is only 10.5" in diameter, and 5.5" high, and only weights 1.1 lbs. It comes with a carry bag too. It really is not at all like a dutch oven, either in style, size or the way it works. This oven has me quite interested. It weights less than a pound, and packs down real small, just the size of the pan, as the lid and other bits fit inside it. I have baked lots of risen dough pizza and bread. Mix the contents of a box of cake mix right in it and bake. Even bannock is nicer baked in this than in a pan or on a stick. I have had it for many years and take it canoeing a lot. Don&#39;t ask me why, but the Coleman oven is not supposed to be used inside. I checked with REI about this, and they said "absolutely not.". Ditto on their product website. Maybe it has to do with the heat output of the burners. Anyway, given the choice between buying one that clearly states it&#39;s okay to use indoors, and another that says don&#39;t, I&#39;ll choose the former. We ladies, we tend to follow the instructions . People complain that because the Coleman can be collapsed, it means gaps for heat to escape. So it takes longer, looses more heat, and bakes less evenly. Thus, wrapping it in foil ... ugh. I&#39;m unfortunately not in the market for a Dutch oven. And I think Jim is right ... this doesn&#39;t seem much like a Dutch oven to me anyway. One more link .. Scroll a down bit within the book (past the Coleman oven) to see the Fox Hill entry. I'm gonna keep my eye out for a species of fish or a cut of beef with a hole in the middle to fit the Omnia. Great for bagels. I can see that the FoxHill would suffer less heat loss, and it weighs less. But, I can't fathom why it would be approved for indoor use and the Coleman wouldn't. The danger would be from the flame, not the container. down on the grill and then cooking on top of that. Response from Omnia, bright and early, from Sweden, is below. Will post Fox Hill email when I get it. Surprisingly, no mention of giant bagels. Thank you for your e-mail and for your interest in Omnia. There are thousands of people in RVs around Europe that enjoy fresh bread and oven cooked dishes thanks to the little ingenious oven. Almost everything you can heat, bake or cook in a traditional oven can also be cooked in Omnia. The reason why Omnia provide top heat is the centre hole in the base plate and in the baking pan. Therefore Omnia is only available in one shape. Your cookies will be a "cookie ring" and maybe you have to cut your frozen pizza into smaller pieces. Or bake a calzone. baglo, good point about the BBQ. I have baked on mine a few times before. The biggest issue is usually keeping an even heat, but it most definitely can be done. I would think fish would work great in that Omnia, you would just have to cut it into segments. We often do this with larger fish anyway. For beef, you just might have to suffer with strip loins.